Navi Mumbai: Kotak Mahindra Bank emerged as the winner of the Navi Mumbai regional round of Tata Crucible Corporate Quiz 2017. The quiz, which will traverse 25 cities in India, is giving quizzing enthusiasts within corporate India a chance to lift the coveted trophy. Around 36 teams from prominent corporates across Navi Mumbai participated in the event. Mr. Prateek Pashine, President – Enterprise, Tata Teleservices Limited, Mumbai felicitated the winners, who were awarded Rs 75,000/*, while the runners-up took home a prize money of Rs 35,000/*. In addition to the winners and runners-up, the other four teams that qualified in the top six were Danish Aga and Dawood Vaid from Burooj Realization, Siddhartha. B. and Atish Cliffon from Flytxt Mobile, Ruchit V and Raulter Fernandes from Capgemi, and Siddharth and Kashif from Idea Forge Technology. Navi Mumbai brought together some of the young quizzers who showcased skillful use of strategy in the game, giving a very engaging and a fun-filled round. The city regional rounds will be followed by zonal finals, which will be organized in New Delhi (Zone 1), Kolkata (Zone 2), Mumbai (Zone 3) and Hyderabad (Zone 4). 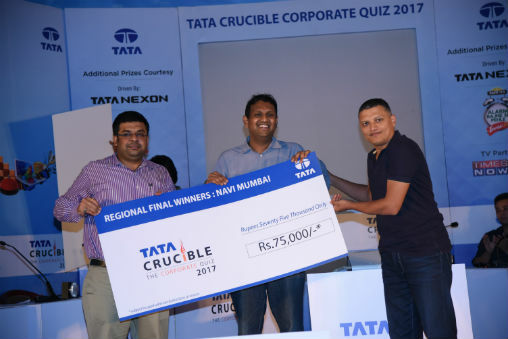 The top two teams from each zone will face each other to clinch the Tata Crucible Corporate Quiz 2017 title at the National Finals to be held in Mumbai in October. The National winners will receive a prize money of Rs 5 lakhs* along with the Tata Crucible Trophy. The prizes for this year’s quiz are supported by Tata Motors and the Jaago Re campaign by Tata Global Beverages.